Dome Firewall simplifies network security by delivering a single interface through which you can control firewall policy, antivirus, intrusion prevention, website filtering and more. The product is provisioned in OVA or ISO format which can be installed on bare-metal appliances and virtual servers such as Virtualbox and VMware. The firewall is free to Comodo One Enterprise and MSP customers. You can add the firewall to your account by getting a free license from the Comodo One console. Alternatively, you can add Dome Firewall by linking to another Comodo Accounts Manager (CAM) or Comodo One account that already has a Dome Firewall license. The service can then be used by both accounts. Click 'Store' on the menu bar to view all available applications. 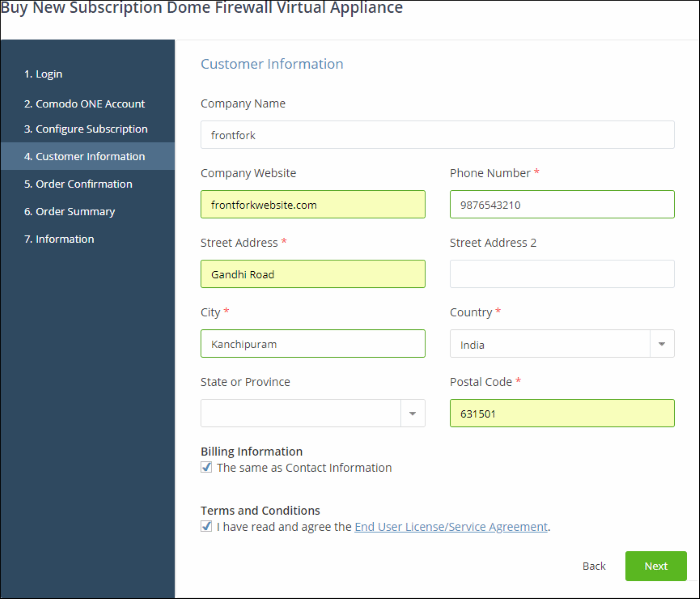 Click the Comodo Dome Firewall Virtual Appliance tile to see product details and features. 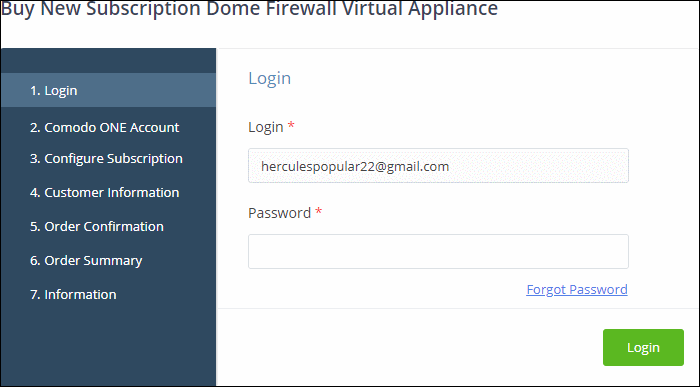 Click 'Free' on the 'Dome Firewall Virtual Appliance' tile to subscribe for a free license. This will open the product purchase page. Enter your Comodo One account password and click 'Login'. You will be taken to the 'Customer Information' page. Click 'Next' to confirm your order. The 'Order Summary' page will be displayed. Click 'How to install?' for help to setup the appliance. See the description	at the end of this section if you need more help on setting-up the appliance. 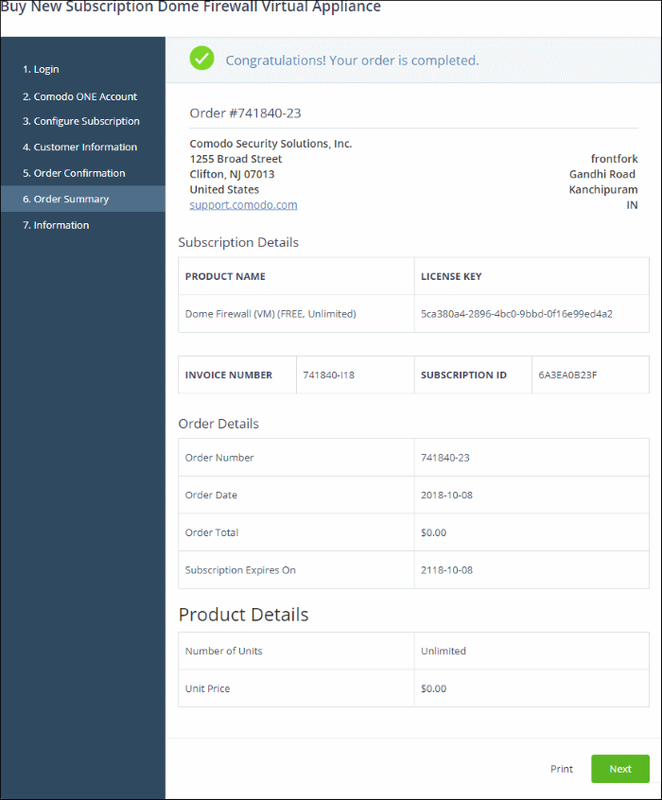 You can activate licenses for your Comodo One account through the 'Store' interface. You can also activate licenses in linked accounts. To do this, you must first have linked an account and set it as default. See Comodo One License Account Details for more details on this process. 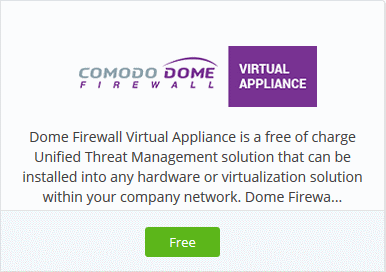 Click 'Free' on the 'Comodo Dome Firewall Virtual Appliance' tile. The license will be activated for this Comodo One account. You can now download the setup files for the virtual appliance. Click 'Instructions' to view installation help and/or download the OVA/ISO files. 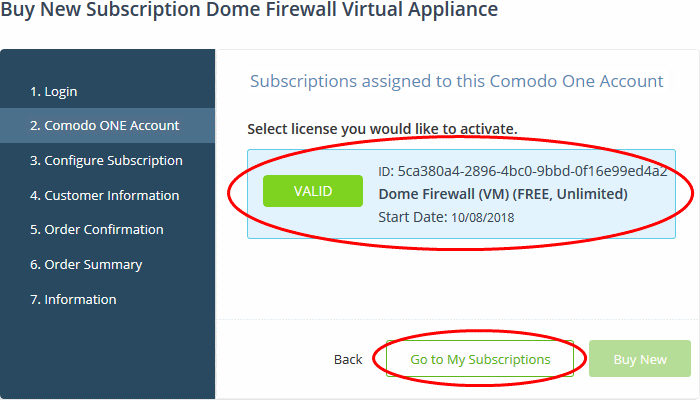 See the user guide at https://help.comodo.com/topic-436-1-912-11986-Introduction-to-Comodo-Dome-Firewall---Virtual-Appliance.html for help on configuration and usage.